WEST LAFAYETTE, Ind. 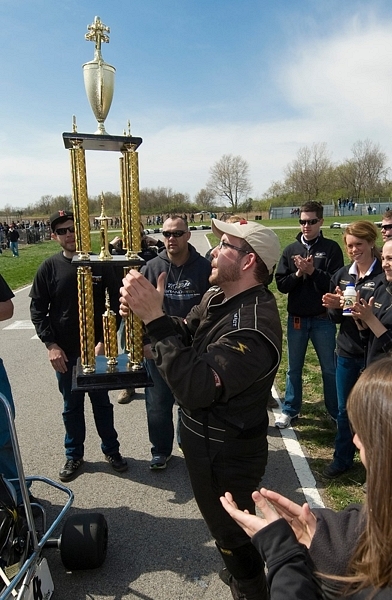 — Justin Penix of Indiana University-Purdue University Indianapolis won Sunday’s (April 17) rain-delayed 54th annual Purdue University Grand Prix, his second consecutive victory in the event. The race was held Sunday after rain postponed Saturday’s scheduled race. Penix started in second position and stayed there throughout most of the first half, trailing pole-sitter Ronny Nelkenbaum of the Society of Hispanic Professional Engineers team. Penix went in front on lap 80, but Nelkenbaum surged back in front when Penix made a pit stop. Penix came out of the pit area right behind Nelkenbaum. A few laps later, Penix passed and held the lead the rest of the way. “Two in a row is unbelievable,” said Penix, a senior from Indianapolis majoring in mechanical engineering technology toward a motorsports degree. “One was great, but two is just amazing. After qualifying second, I was bummed out, so this is special. Penix is the fifth driver to win consecutive races, and the first to do it since Timothy O’Brien in 2002 and 2003. Nelkenbaum finished second and Ryan Lee of Sigma Chi, a junior from Fort Wayne, Ind., majoring in management, was third. Nick Norris of Fuhrman No. 2, a senior from Wilmette, Ill., majoring in aviation technology, was fourth. Official results from the 2011 Grand Prix will be released Monday (April 18), following a standard review by the race’s scoring board. Sarah Fisher, owner of Sarah Fisher Racing in the IZOD IndyCar series, and Ed Carpenter, now driving for Sarah Fisher Racing, were grand marshals for the Grand Prix, which is organized each year by the Purdue Grand Prix Foundation. The foundation is a student-run, nonprofit organization that conducts the kart race and related events each year to raise money for student scholarships. 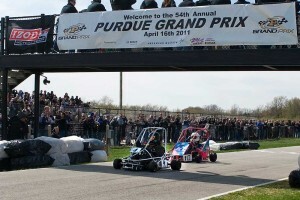 Grand Prix Student Ambassadors presided over race-related events. They are Simon May of Fort Wayne, who’s studying advertising and sales marketing, and Carolyn Collins of Indianapolis, who’s studying chemical engineering. Among their duties, ambassadors serve as spokespeople for the Grand Prix Foundation and encourage race support and business sponsorship. The ambassadors each received a $1,000 scholarship from the Grand Prix Foundation. Sixteen other students received scholarships ranging from $250-$750. The foundation also receives support from Jimmy Johns, Coca-Cola, Spurlock’s, Chick-fil-A, Puccini’s Smiling Teeth Restaurant, Hungryboiler.com, Moe’s Southwest Grill, Taco Bell, Lockheed Martin, Bosch, BOB 95.3, WSHP 95.7, WAZY 96.5, Wright Implements, Fairfield Manufacturing and NOS Energy.